During the first part of 2004, the RIPE NCC carried out a survey of members asking those taking part to predict how many Local Internet Registries (LIRs) they expect there to be in their home country over the next two years. For member activities and budgeting purposes, the RIPE NCC relies on annual membership growth estimates. This is particularly important when setting membership fees. The primary aim of the survey was to enable the RIPE NCC to better plan for future growth. The RIPE NCC does already look at past trends and uses industry knowledge to predict growth. It was felt that these figures could be significantly improved by using the knowledge of the market and local conditions offered by our members. The survey was available for eight weeks through the secure LIR Portal. When members logged into the survey they were presented with a summary of how many RIPE NCC Members were registered in their home country over the past five years, provding an indication of past growth trends. The RIPE NCC was not looking for exact figures, rather best estimates. How did we interpret the responses? For each individual country, we took a weighted average. This means that we looked at the spread of predictions around the overall average. Thus a lower weighting was given to respondees whose predictions differed significantly from the majority of responses received for each country. From this we were able to look at the figures on a deeper level. We produced two ranges of figures. One showing a 65% probable broadband prediction for membership numbers at the end of 2004 and another showing a 95% probable range. These results can be seen in full here. The RIPE NCC uses variables to determine the growth percentages and formulate a broadband figure for growth over the coming year. These include recent growth trends, growth over the past 2/3 years and the number of closures in each country. The RIPE NCC is currently suggesting that the broadband of growth for 2004 will be between 3530 and 3964 LIRs. The survey has shown that, overall, our members feel that in 2004, numbers of LIRs will remain fairly stable. The figures from the survey fall into a similar range to those suggested by the RIPE NCC, though the upper and lower limits are extended slightly. Those who completed the survey suggested a figure somewhere between 3352 and 4209, the average overall for 2004 though gives a figure of 3631, well within the RIPE NCC predicted range. The overall result holds up throughout the survey with results from most countries predicting a similar though slightly wider band of numbers, in almost every case the average prediction from each country was well within the broadband figure suggested by the RIPE NCC. Predictions for 2005 are, it appears, far more optimistic, suggesting members see an average growth of around 7-8%. The areas that seem to show the greatest optimism are Russia and the Middle East. Here growth rate predictions average at 12%. 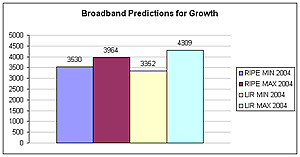 The RIPE NCC predicts a broadband total between 3610 and 4025 by the end of 2005, our members place the figure at 4085. Taking a deeper look at the predictions from Russian LIRs, however shows that this optimism is not shared by all those who completed the survey in that country. There is a spread of almost 26% around the overall average. In the Middle East however, the spread is relatively low at just 13%, pointing to a geographical area in which a majority of members feel there will be growth far above the average levels seen elsewhere between now and December 2005. The least optimistic results came from Eastern Europe. In most areas or countries, LIR broadband predictions for 2004 growth gave maximum ranges outside the broadband figure suggested by the RIPE NCC. In Eastern Europe, members predicted a figure between 482 and 583 (RIPE NCC broadband prediction is 540-610). The average prediction for 2004 is 485, down considerably on the current level of 545. The figure suggested for 2005 averaged out at 550. The table below shows the average figures predicted for each country for the end of 2004 and 2005.